Ghoulish is a Perk in Fallout 4. It is associated with the Endurance Stat. 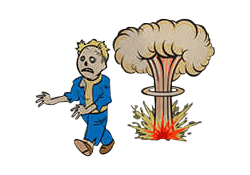 The perk does not make you immune to radiation damage, nor does it heal radiation damage. Rank 1: Sure, you're still human - on the outside! Radiation now regenerates your lost Health. Rank 3: Radiation now regenerates even more of your lost Health, and some Feral Ghouls will randomly become friendly.